Alice Though the Looking Glass opens at IMAX Melbourne this weekend. 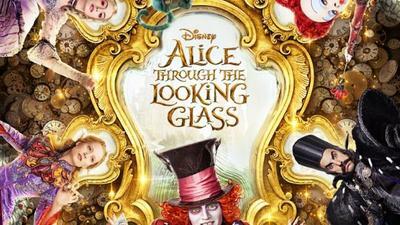 The sequel to Tim Burton's Alice in Wonderland (2010) sees Alice return to Underland. It becomes apparent that Alice must save the Mad Hatter from his demise after a bought of depression following his refusal to believe his family has passed away. Produced by Tim Burton (among others) Alice Through the Looking Glass, is based on the novel Through the Looking-Glass by Lewis Carroll, and is the sequel to the 2010 film Alice in Wonderland. If you are a fan of make-believe, this movie is for you. Be taken on an adventure back to Underland, where you will once again meet the Cheshire Cat, the Tweedle brothers, Absolem the Caterpillar, the March Hare, Mad Hatter and the rest of the familiar crew. This time, Alice is the adult version of her curious self, although she still carries the wonderment of your youth. Having returned from a life on the high seas, on a sailing vessel once owned by her father, Alice jumps back into Underland, escaping a life she does not wish for. Without giving too much of the story away, Alice Through the Looking Glass explores the back story of the characters you know and love from Alice in Wonderland. In my humble opinion, Sacha Baron Cohen playing the role of Time, shines in this movie adaptation. Helena Bonham Carter playing the Queen of Hearts aka Iracebeth, who also happens to be Time's love interest, works wonders for Alice Through the Looking Glass, too. Seeing Alice Through the Looking Glass in 3D is worth the experience. Why not make the colouful, psychedelic world of Underland jump out in front of your eyes, so you can get lost in a whimsical world of fantasy, if only for a little while. Go one step further and experience Alice Through the Looking Glass in 3D at IMAX Melbourne, and enjoy the best sound and visuals this city can offer on Australia's only IMAX Laser Projector. Should there be a cut-off age for women to wear mini-skirts?